Fighting for Canada is a study of seven battles fought either to defend Canada or by Canadian soldiers overseas. The work of six professional historians (four of them combat arms officers), Fighting for Canada emphasizes the tactical level of war -- the sharp end of the business where soldiers kill and are killed, and where personal leadership, training and experience are of paramount importance. The actions included are Ticonderoga, 1758; Queenston Heights, 1812;Ridgeway, 1866; Leliefontein, 1900; Moreuil Wood, 1918; Le Mesnil-Patry (Normandy) 1944; and the Kapelsche Veer, 1945. Edited and with an introduction by Donald E. Graves, Fighting for Canada will appeal to any reader interested in military history, the nature of combat and the meaning of courage. Details: Hardcover and quality softcover; 446 pages; 7" x 10"; approximately 80 illustrations and maps; index; bibliography; source notes; appendices with detailed orders of battle and lists of medal and award winners. "In the field of military history, Donald Graves is well known and respected as a researcher, writer, and editor. In the seven battles described in Fighting for Canada, he emphasizes "the sharp end, where soldiers kill and are killed, and where personal leadership, training, weapons and experience are of paramount importance." ...... After each account, certain lessons are suggested. Those most frequently mentioned are the importance of intelligence leadership, thorough training, planning, knowledge of the terrain and the enemy's dispositions, and trust among soldiers. ....... 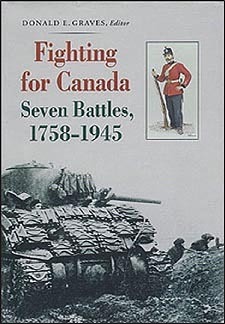 Generously supported with maps, illustrations, a bibliography and nine appendices, Fighting for Canada belongs on the shelf of anyone with an interest in military history." "This tour through triumph and tragedy, when the Canadian was a fighting soldier and not a semi-toothless United Nations' peacekeeper, bound by "rules of engagement" is an excellent read." "This is the view from the trenches, or in Graves's words from the 'sharp end' ... For friends of military history, Fighting for Canada ... may be one to add to your "want" list." "The grim detail of seven bloody encounters are presented. ...... Fighting for Canada "does succeed in making every battle (if not every war) comprehensible. ... If you want the details of well known, but not before well-analyzed, encounters, read this book." "Donald Graves has established himself as a premier student of ... combat narratives. ...... For those interested in detailed studies of small units in combat this is a primer on how such accounts should be researched and organized. Christopher Johnson's maps and illustrations are examples that more operational studies can emulate. ...... Although the detail is mind-boggling, for those weaned in the "lessons learned" school of combat analysis, these studies will be great ingredients for discussions at ... military schools for years to come." "Over the past twenty years, ... military history has increasingly given attention to the experiences of non-combatants and of ordinary soldiers, and to the lessons of warfare, rather than simply dealing with battles and military heroes. Such a change makes this history more interesting and meaningful and one of the main contributors to the trend has been the editor of Fighting for Canada. ...... He does not view the future optimistically because he warns, as armed conflict continues to occur across the world, 'Canadian soldiers, while praying for peace, must prepare for war.' ..... Anyone with an interest in Canadian history should find this book fascinating and it is a must for any student of military history." "What a delight this book is! ...... Graves's introduction is an excellent primer on the nature of the tactical fight -- 'the real business of war.' ...... each chapter provides detailed and scholarly analysis of the battle in question. In many cases the historical record is corrected as authors make good use of a wide variety of primary and secondary sources. In other cases, the authors are breaking new ground, examining in detail minor tactical engagements that have long been ignored and forgotten. ...... This is military history as it should be written: sound in reasoning, precise in detail and firmly placed within the relevant political, military and social contexts. It incorporates the testimony of private and general and does not shirk, where necessary, from passing judgement or according praise. It causes one to think, and think again, on the military history of our nation -- and I can think of no higher praise." "The authors -- various military historians -- should be rewarded for their diligent research and writing skills. Their battle narratives are compelling without being naive and manage to avoid oversimplification in the name of meaning." "This is an excellent work which belongs on the bookshelves of military history buffs and serious students alike. Every school and military library should carry a copy. I guarantee it would be well read."